We all have too many shoes and not enough places to store them all. Whether your footwear is kept by the front door, under the bed or at the bottom of the wardrobe, shoes so often revert into a jumbled mess of odd ones and tangled laces. But hopefully not for much longer! Be inspired to organise your shoe collection with our selection of stylish and practical shoe storage cupboards in sizes to suit every available space. 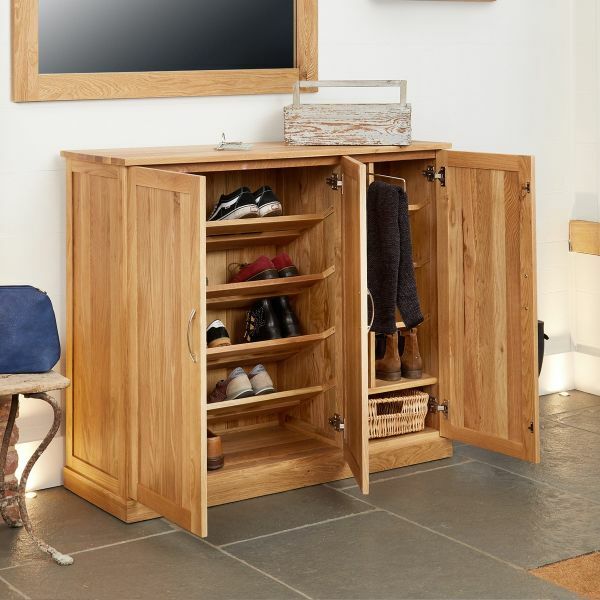 Quality solid wood shoe cupboards are a great way to keep your family’s shoes neat and tidy. Instead of leaving shoes sprawled across the hallway floor or in a heap by the front door, why not make it easy to find the shoes you need each time you go out? 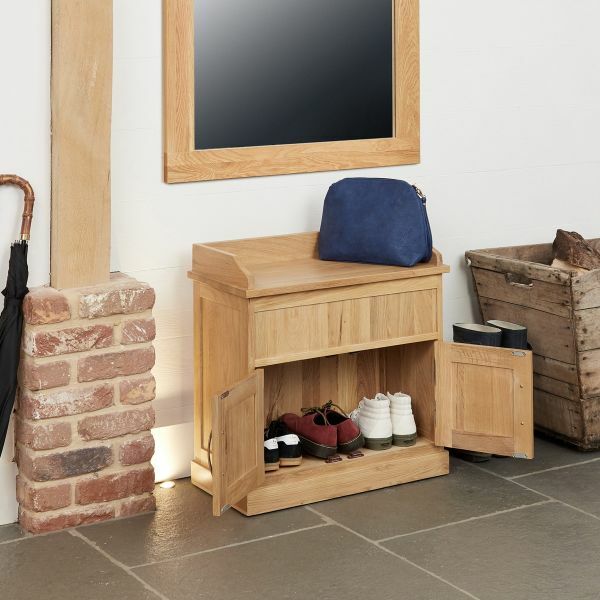 Not only do shoe cupboards offer great storage but they also add character to any hallway and many of our ranges have co-ordinating console tables, mirror and coats rack to ensure that your hallway makes a great first impression. If you're looking for shoe storage solutions, look no further! 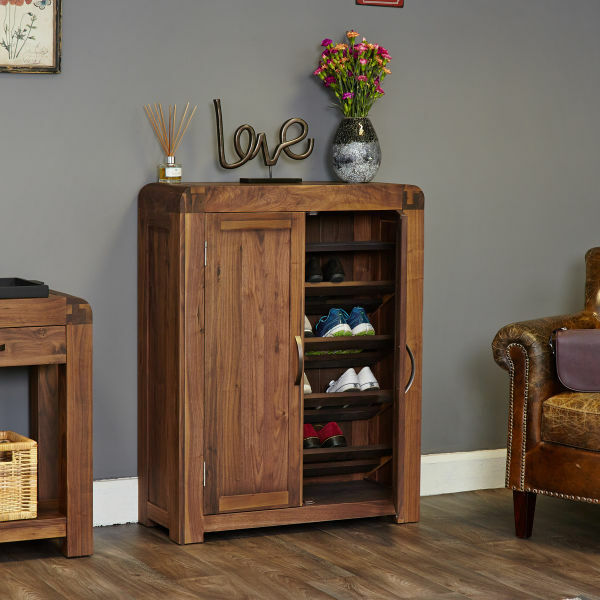 The Wooden Furniture Store's range of stylish space-saving designs are both smart and functional, keeping everything neat, tidy and well organised. Think freestanding tall shoe storage cupboards with seven rows of shelving, oak shoe benches hat double up as seating and even extra large shoe cupboards that can hold up to twenty pairs of shoes. 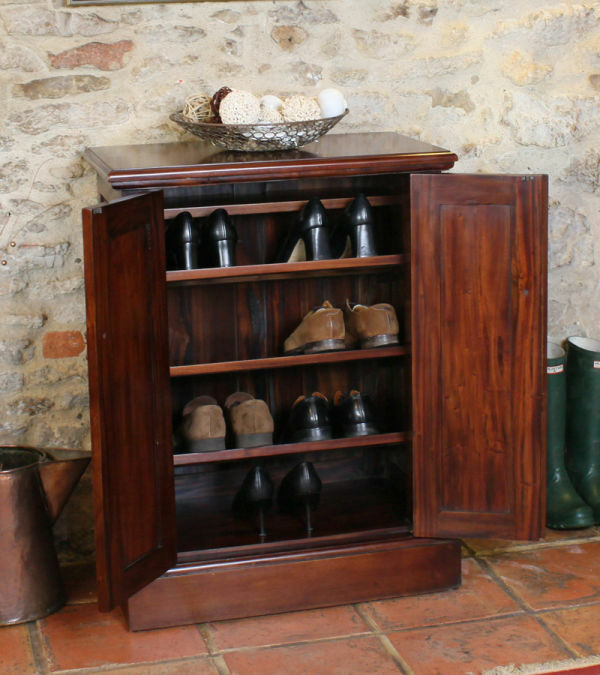 Many of our shoe cupboards are designed with adjustable shelves - perfect for fitting in boots without having to bend them. We say make the most of your space without compromising on style! 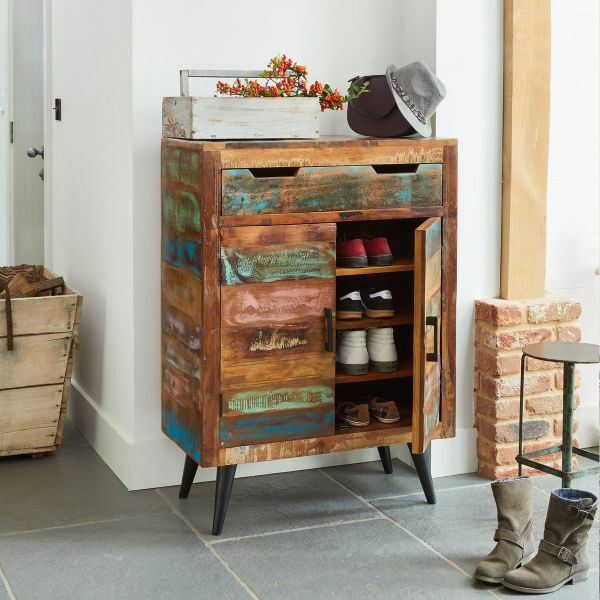 With so many ways to store shoes, it can be hard to pick the right design for your home. One thing that you should think about before you buy any kind of storage, is how many pairs of shoes you'll want to tidy away, as well as where the shoe cupboard will go. In a small porch or hallway, try a simple wooden shoe cupboard that takes up minimal space while keeping shoes easily accessible. Built to last behind the panelled doors you'll find enough racking to store up to twelve pairs of sling backs, sneakers or slippers. 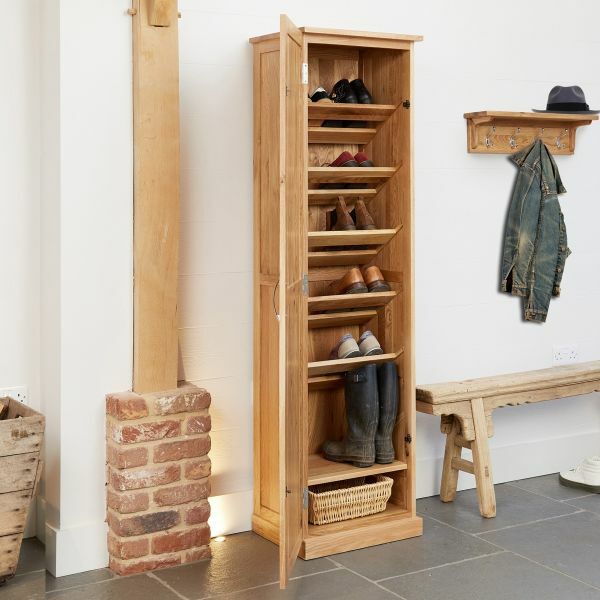 Our tall shoe cupboards will look smart in your hallway or by your back door and solve the problem of shoe clutter once and for all. They are perfect if you need shoe storage that's space saving as well as handsome and practical. These designs can hold sixteen pairs of shoes and come with a handy basket at the bottom which ideal for gloves, hats and scarves. 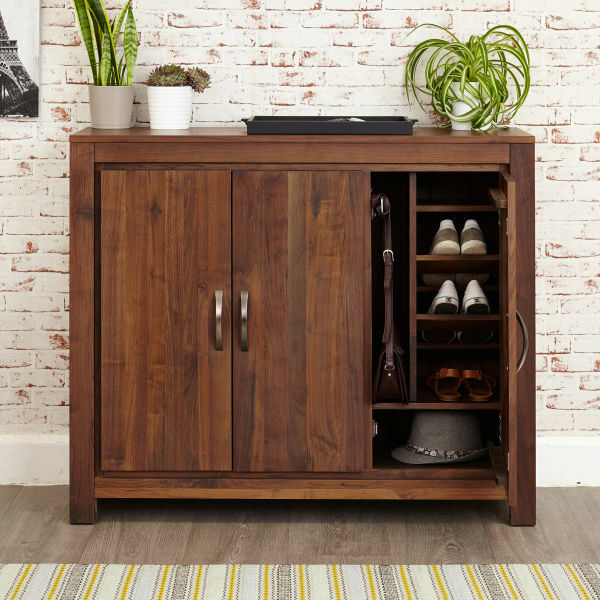 Elegant and functional, our range of extra large shoe cupboards are versatile pieces of furniture that will look great where ever you put them. Hidden behind the three doors is space for twenty pairs of shoes and the design also includes a pull out rail for holding umbrellas plus a storage basket. 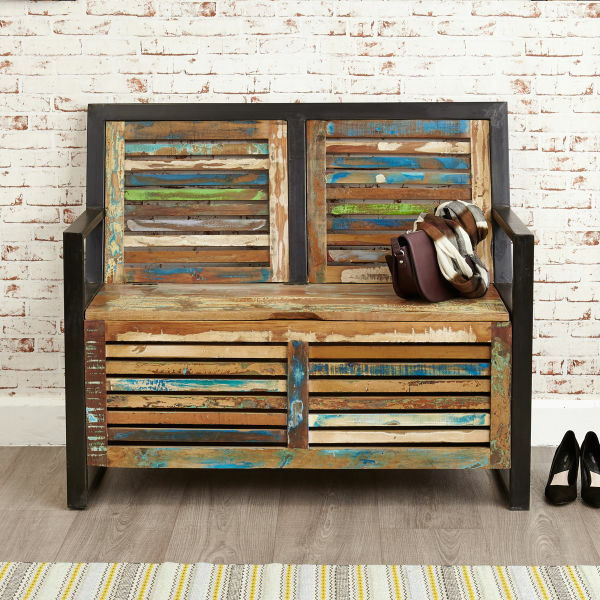 An oak shoe bench with storage is perfect for stowing away boots - lift up the bench top and you'll find room underneath. 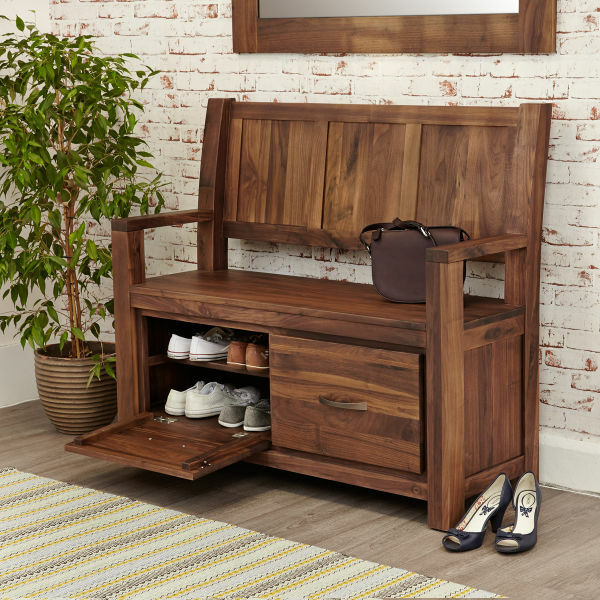 Where space is no object, then as an alternative wooden shoe storage units, why not consider a Monks Bench which gives you somewhere comfy to sit when you are putting shoes on or taking them off. Your hallways can easily become a magnet for clutter if you don't keep it organised. That's why here at The Wooden Furniture Store, we offer shoe storage solutions that will help you and your family store your shoes in style. 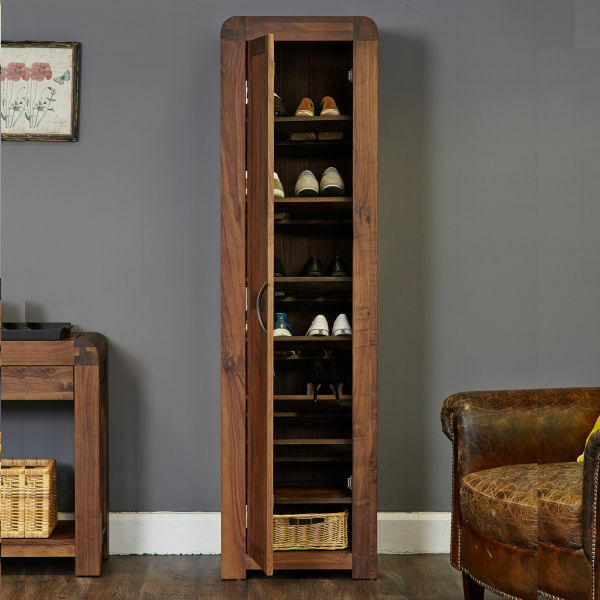 Whatever design you're after, as specialist in solid wood furniture, we stock a comprehensive range of shoe cupboards including versions in solid oak, walnut, mahogany and reclaimed timber sourced from Southern India. A satin varnish on our oak shoe cupboard brings out the unique grain and the simple metal handles give the cabinet a sophisticated finish. Walnut will transform your hallway into something really rather special. It's beautiful to look at with an appealing dense natural grain pattern which creates a real statement piece of furniture. 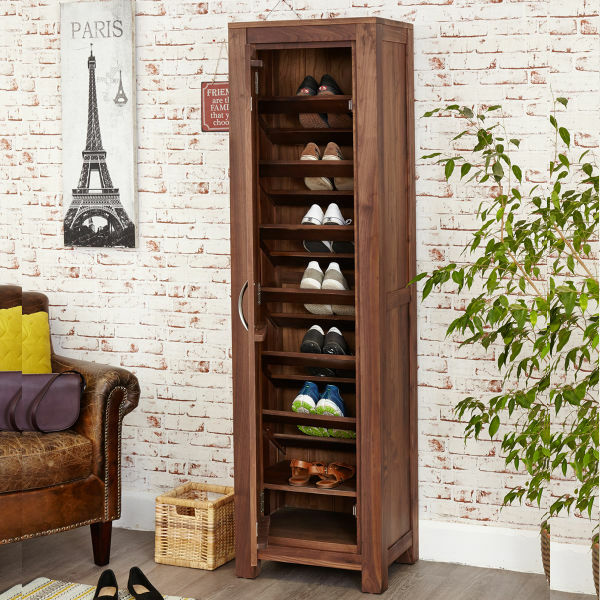 A sleek mahogany shoe cupboard with hand carved detailing is the perfect choice in a bedroom if you're looking to store out of season footwear. 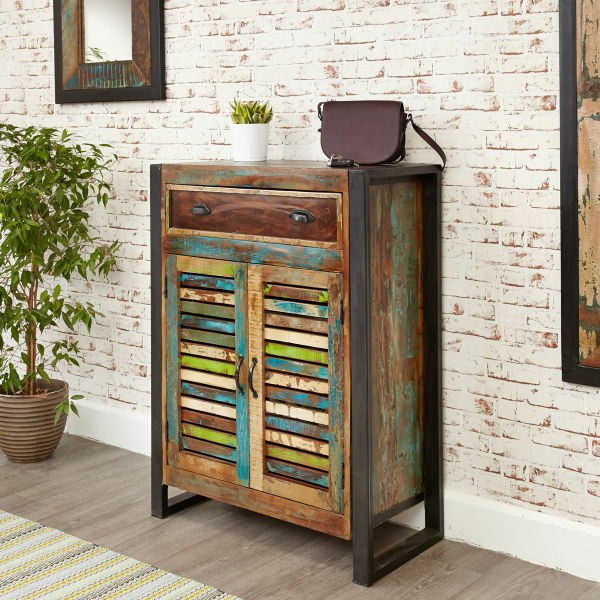 Or add an industrial feel to a hallway by choose from our stunning range of reclaimed wood shoe cupboards which have metal outer frames. 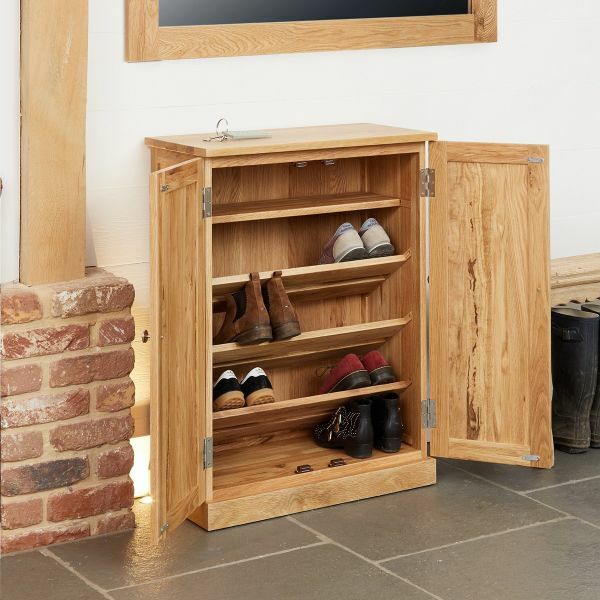 All of our shoe cupboards are made from solid wood and treated with a durable varnish to enhance the timber grain and protect against everyday wear and tear. All shoe storage solutions have dovetail drawer joints and are finished with elegant fittings to ensure that they look perfect - as good as the day they were purchased - in years to come. 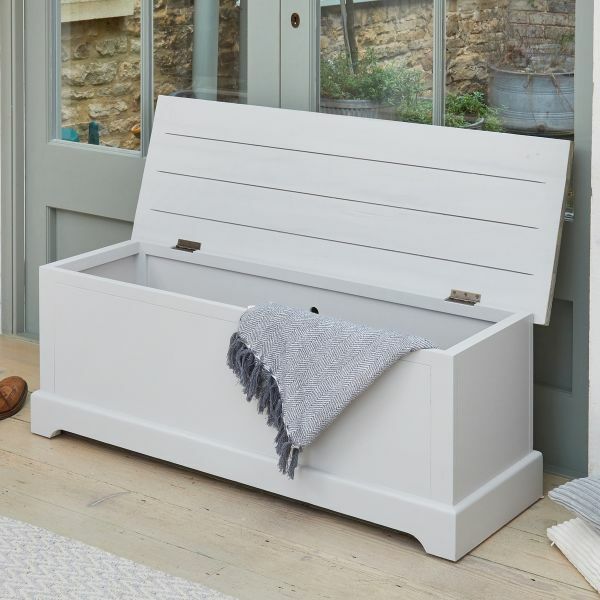 Orders are delivered free to most postcodes and all shoe cupboards arrive fully assembled, direct to your door delivered by our considerate logistics teams. So whatever your available space and style, any item purchased from the Wooden Furniture Store is an investment for years to come; all of our furniture is of the highest quality, with many ranges guaranteed for five years. 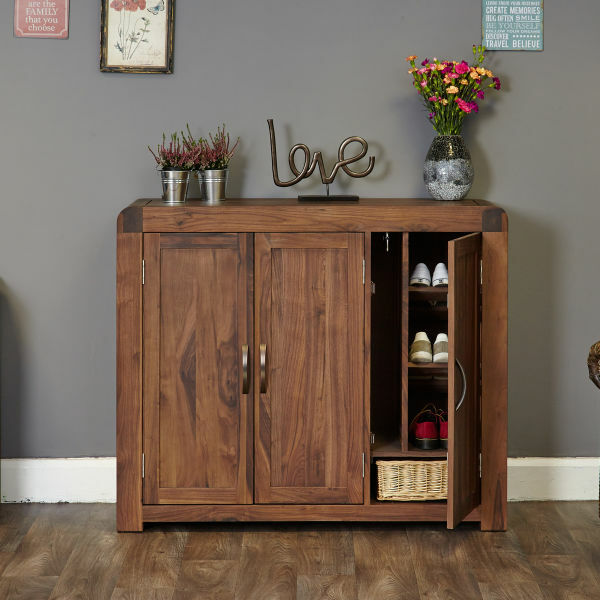 Whether you want a shoe cabinet or prefer a monks bench instead, you'll be able to find them all at The Wooden Furniture Store. 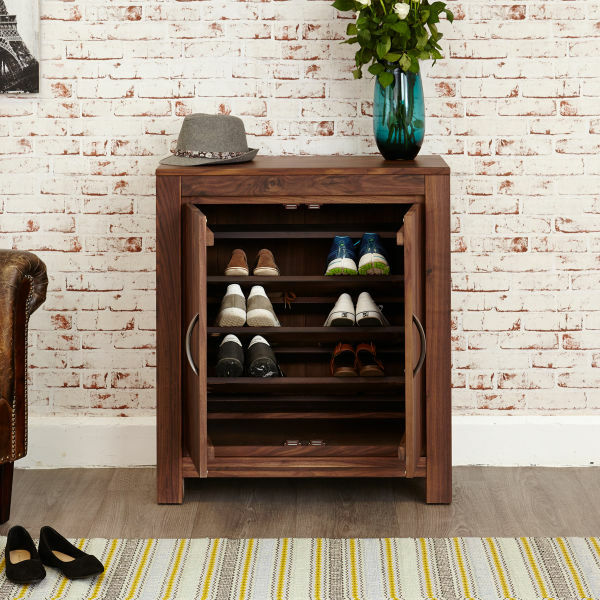 So put your best foot forward and choose your ideal shoe storage solution.